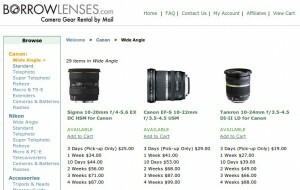 Our friends at BorrowLenses.com have offered to give away another free lens rental to a lucky Photodoto reader. It’s been a little over a year since we did our last lens rental giveaway. Last year’s winner rented an 85mm f/1.8 and loved it. That’s it! (Except for a few conditions, below.) The comments will remain open until Tuesday November 17 at midnight. After that, BorrowLenses.com will choose a winner and we’ll announce it here. Good luck! And a big thank you to BorrowLenses.com for sponsoring this giveaway.